Maîtresse Jaquelinne contacted me after I posted the first few interviews with other scribes and kindly offered to be interviewed. 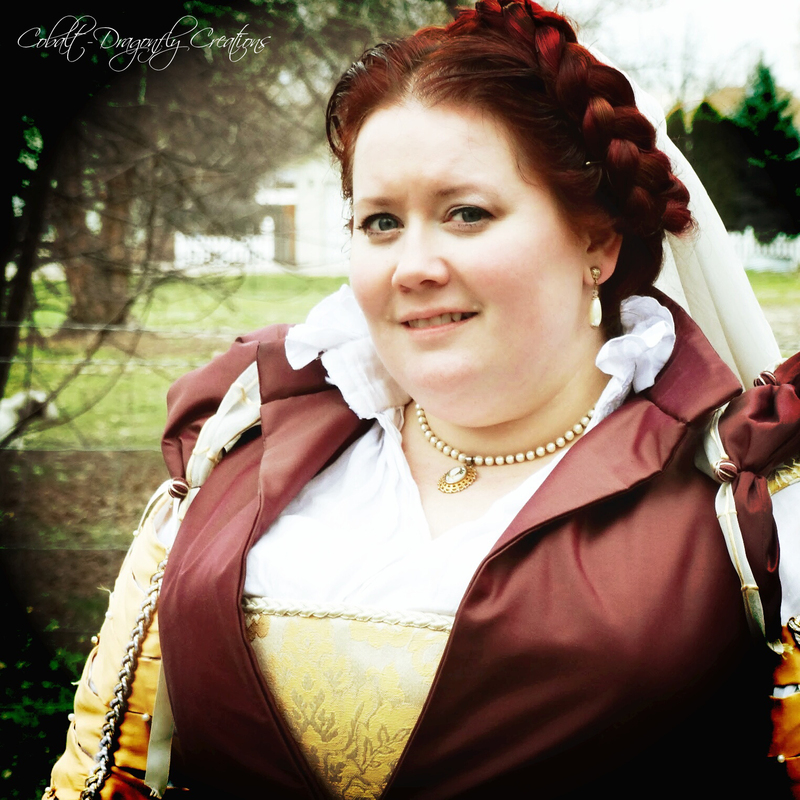 She shares some great advice as well as a wonderful story about how she discovered the SCA. I am Maîtresse Jaquelinne de Radonvilliers, member of the Order of the Laurel since January 2010. Mundanely, I’m Crystal Marinelli. I have been playing in the SCA since about 1996 after a friend of mine found a discarded copy of the local Kingdom newsletter and discovering that there was a medieval dance practice every week in a local park. I was immediately hooked. 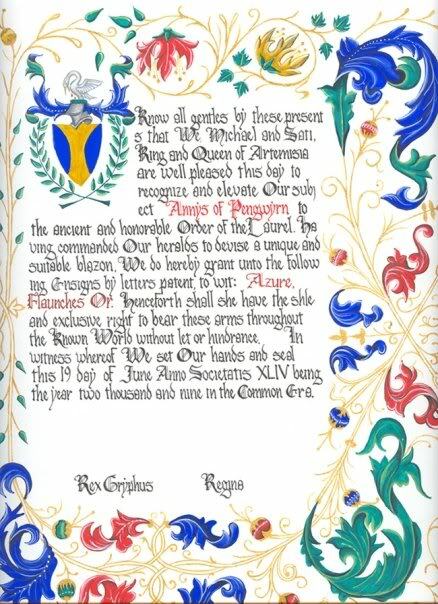 I didn’t become involved in scribal arts until about 2001, when friends of mine were chosen to be the next Baron and Baroness of the Barony of Loch Salann, in the Kingdom of Artemisia. I decided to do a small “congratulations” card for them. This escalated to me doing my first SCA scroll for them as well and it’s all history from there. 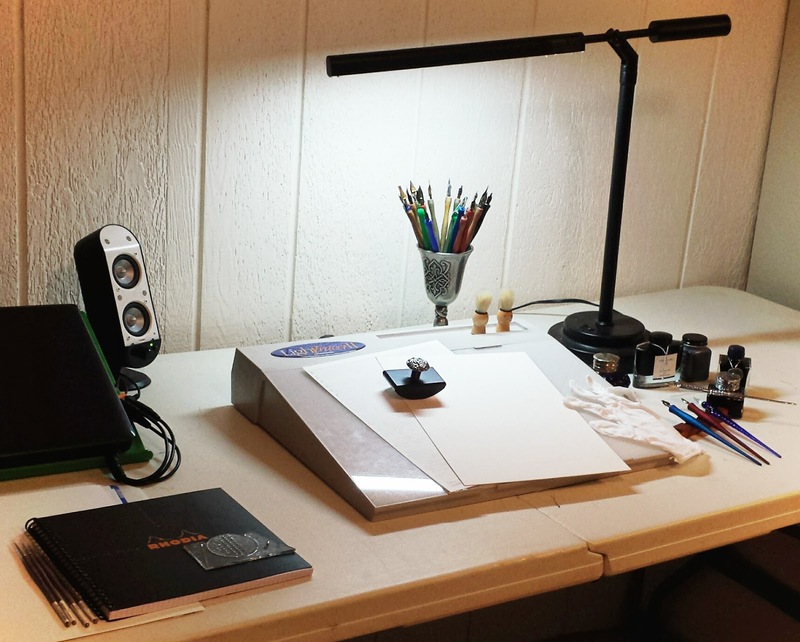 I had always been interested in being involved in the scribal arts, but it took friends being in a position to encourage me to make it happen. I blame my shyness. Back in High School, I dabbled in calligraphy as part of a commercial arts class, and I took a calligraphy course in College. I guess you could say that calligraphic arts have always been dear to my heart. The illumination side has been all self-taught trial and error. I’d like to think I’m well rounded, or at least I try to be. I have done quite a few collaboration pieces where it’s just calligraphy, but my true love will always be completing full illuminated works on my own. 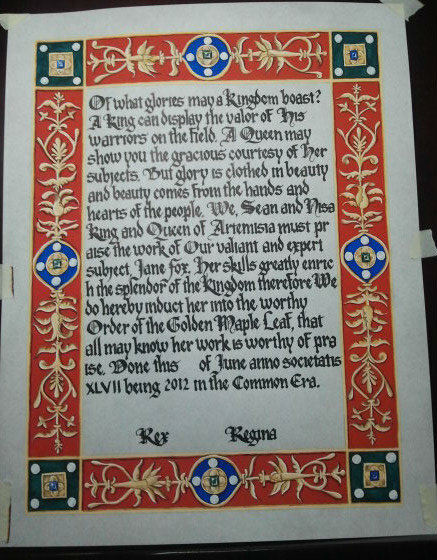 It’s easier to create an authentic piece doing both calligraphy and illumination, guaranteeing styles that are cohesive. I find that collaboration work requires very careful communication in order to create a unified vision. I encourage everyone to give calligraphy a try! For some reason it intimidates people and they’re missing out. I adore Brause nibs as I tend to have a heavy hand, but lately I’ve been toying with more flexible nibs and have been surprised at how much I like them – they’re an off-brand, but are very similar to Mitchell nibs, (which I recently bought to give a try – I’m an advocate for trying new tools and materials whenever possible). 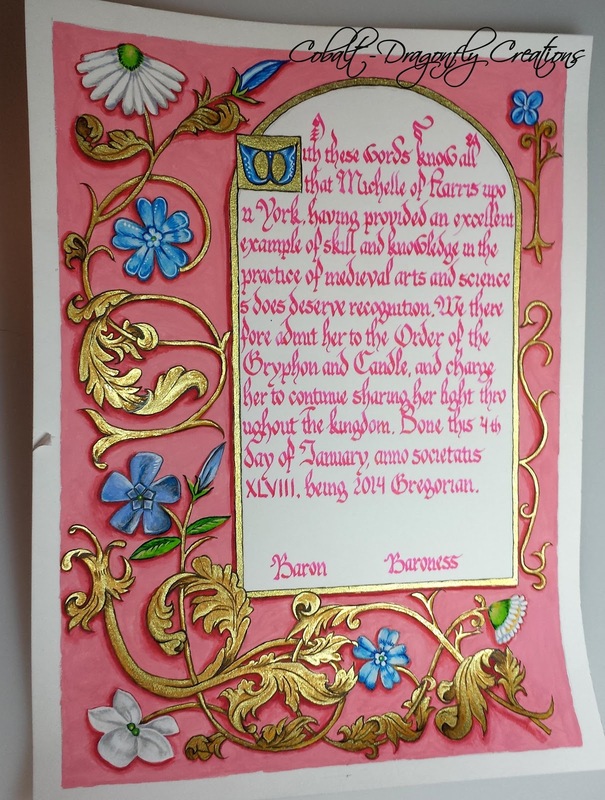 As for papers, I typically use Bristol vellum finish paper (it works well and is inexpensive), unless it’s a special occasion scroll – someone I personally know, or a peerage – in which case I will use pergamenata or a higher quality hot press. I will also play with other papers if the specific project merits it. It’s important not to become “married” to a specific brand because it inhibits your growth. My favorite paper to practice on is Rhodia graph paper, which helps guide vertical strokes for consistency, while still being a quality smooth paper. I can’t speak high enough of Rhodia. As for ink, that’s a hard call. My husband is a collector of inks, and has been having me try all kinds lately - easily over 100 different bottles. I can say that I have been very impressed with Pilot Iroshizuku Take-sumi, Lamy black ink, and a few others. I plan to publish a blog post about my ink trials in the near future. My true-light lamp is #1. My studio is in a dungeon-like basement with only one window, which has a plastic window-well cover, letting little natural light in. The overhead lights are dim and some are fluorescent. I do intend to renovate the lighting situation, but for now, my true-light lamp is a life saver. My light box is also important to me. I recognize that lining manuscripts is period, but my modern eye prefers to create pieces sans lining. It’s a conscious choice I make. I use the light box to make that happen. I also adore my Ames lettering guide and T-square. Oh, and I always keep a roll of paper towels handy. As I don’t do public demonstrations (I’m a very private person when it comes to my process), my work space is not a bastion of period tools and woodwork, much as I’d love to have that one day. I use a simple table and task chair. The light box is front and center, though sometimes I do borrow my husband’s editor’s desk. 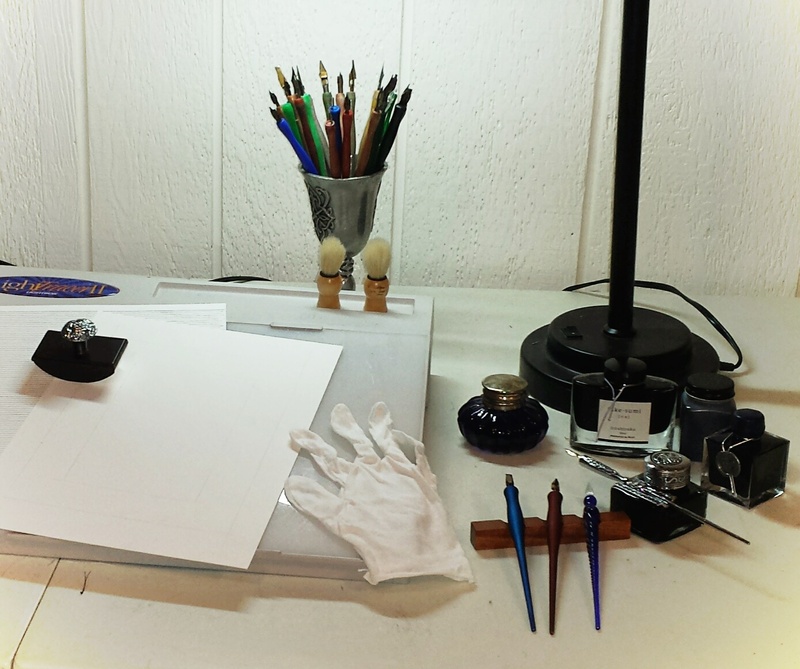 I have a series of different kinds of rulers and T-Squares hanging to my right, and I lay out the table with my ink of choice, clean water to clean the nibs when done, and my nibs/nib holders within reach. I also keep paper towels, erasers, and a scrap paper for starting the nibs when freshly dipped. (I always scribble a little on a scrap paper to ensure there are no large drops of ink to mar the work surface). If I’m working on pergamenata, I keep my pounce handy, and always wear white gloves – though I do cheat and snip the fingertips off because I need the tactile sensation of holding my penholders and brushes – but I’m always careful not to touch the paper. My preferred script is Gothic Textura Quadrata, as I know it well enough I could do it in my sleep – its methodical yet decorative contrast appeals to me. 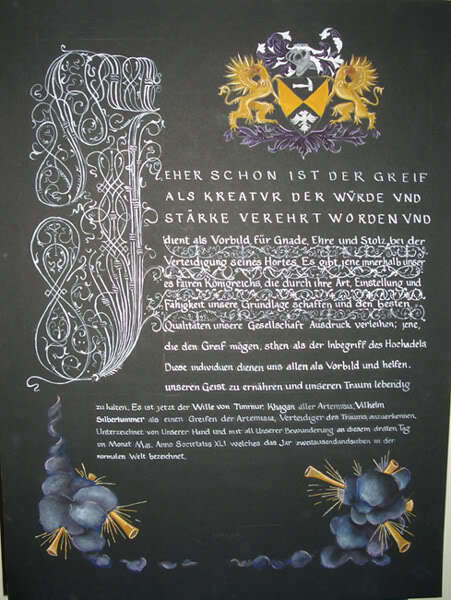 In addition to that is that since it was popular for so many years, it is very versatile when creating scrolls. My second favorite is Batarde, which is something I need to work on more but I love how fluid and organic it feels. I then refer to a collection of wording samples I’ve compiled over the years and usually end up wordsmithing something somewhat unique to the individual if given enough time. During this process I refer to my library of books on illuminated manuscripts and find something to base the illumination on, or inspire the illumination. I try to focus my search on styles appropriate to the recipient’s culture or time period, or something that will push my skills. I first figure out the spacing on the paper, by blocking out the areas needed for illumination and doing some samples of calligraphy to determine the best pen nib size. I do not over-think or plot out the calligraphy letter by letter, but do want to ensure letter height and chosen text will all fit on the page in a natural way. Sometimes I change the text on the fly, when spacing becomes an issue, i.e. I’m running out of room. I do the calligraphy first, and then the illumination. I have not done too much with gold leaf, but when I do, that step goes after the calligraphy, and before the illumination. Leaf is something I want to incorporate more – for some reason I find it intimidating. Is it fair to say all of them? I do refer to Marc Drogin’s Medieval Calligraphy: Its History and Technique quite a bit, but also really like Two-Thousand Years of Calligraphy by Dorothy E. Miner, and The Art of Calligraphy: A Practical Guide to the Skills and Techniques by David Harris, as well as a few others. I have an unholy love affair with acanthus, loud color, and organic designs, so late period Italian designs make me swoon with happiness. Treasures from the Italian Libraries by Lorenzo Crinelli is a great source, but my all-time favorite book is The Painted Page: Italian Renaissance Book Illumination 1450-1550 (Art & Design) by Jonathan J. G. Alexander. The book that started my library was Codices illustres by Ingo F. Walther and Norbert Wolf, so that will always hold a special place in my heart. What’s the best part of being a scribe? I love being a part of recognizing people for impacting The Dream, and growing as an artist as a result of my participation in that process. If people didn’t do amazing things to contribute to the success of the SCA, such as create art, fight, serve, etc, my art would be nowhere near the level it is. The very best part is seeing the face of the recipient when they are given a work of art in gratitude of their impact. Windsor & Newton gouache on black illustration board. Text is humanist bookhand and Roman also in gouache. Seeing scrolls mistreated. So many valuable hours and materials go into making these works of art, and there is the potential of having these devalued by recipients who simply don’t understand what they have received. I also get very frustrated with the concept of combat scribal work – work being asked to be completed at an event, with hours until court. Scribes deserve to enjoy their events too, and while there are exceptions to the rule, for the most part awards should be thoughtful enough to merit advance notice for creation. 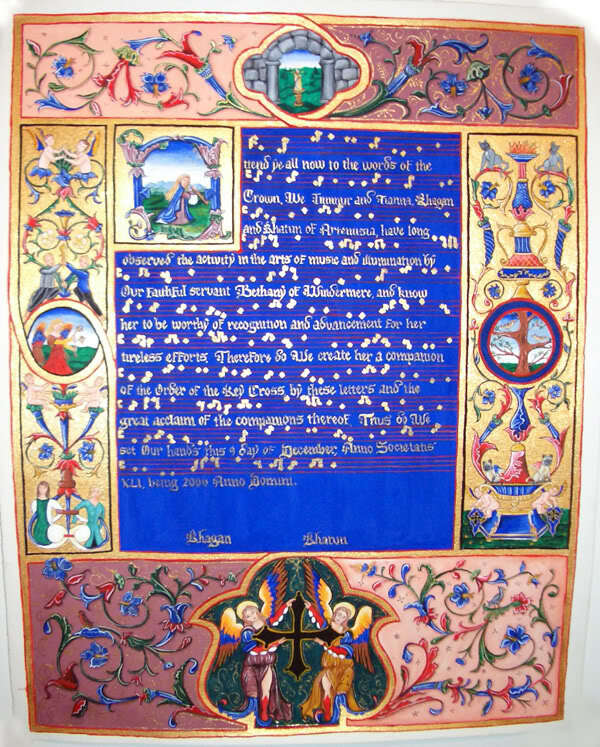 While opinions and reaction certainly vary from person to person, Calligraphy and Illumination are my form of meditation, and are best done in the privacy of my home. Practice, practice, practice. Calligraphy is one of those skills that will slip if you don’t practice it. I suggest practicing on graph paper. Find joy in drawing letters. And if you find you’re gripping your pen too hard (also called getting the claw-hand cramp of doom), clutch a stress ball or wad of paper towels in your off-hand. You will find your grip eases a little when doing this. Keep a record of your work by scanning or photographing every piece you do. This will help you track your progress and your body of work. Don’t be shy about getting involved! Subscribe to e-mail lists, Facebook groups, etc. and start gleaning knowledge from experienced scribes immediately. Get in touch with local scribal groups to attend workshops or guild classes. Offer your assistance, or ask for someone to help mentor you in scribal arts. There’s always someone around willing to teach. Based on a page in the Master of Mary of Burgundy c.1471. brilliant gold gouache, Winsor & Newton gold ink. recipient would have wanted, so I did it with no apologies.